Ratoath AC would like to extend our gratitude to Intel and their Involved Matching Grant Program. Mary Keily Club Treasurer and Sinéad McGoldrick club Secretary went to Intel’s involved matching grant program event recently to be presented with a $2,410 cheque and to acknowledge the positive impact intel employees have had on their communities also to mark the success of the program in 2014. Huge appreciation to Intel employee and club photographer Joe Kilgannon for giving his time to Ratoath AC over the years and for choosing Ratoath AC as his local community group. This money is gratefully received by our club it will be put to good use in our upcoming projects. Below photo of Ratoath AC athletes at the Meath Relay Championships with the cheque. 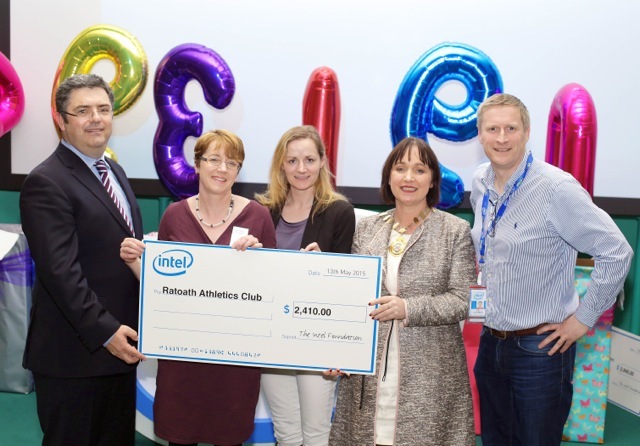 and photo of cheque we received from Intel with Eamonn Sinnott, Intel Ireland General Manager, Mary Keily, Sinéad McGoldrick, the Mayor of Kildare, Fiona O’Loughlin and Joe Kilgannon.